What about Solar Pool Heating? / What about Solar Pool Heating? Why not use the sun to heat up your swimming pool? People buy gas heaters and heat pumps to heat their swimming pools, and pay quite a bit of money for natural gas, propane or electricity to heat their pools. Why pay for heat if you can harness the sun’s energy and use the pump you already use for filtering pool water to heat your pool with no additional costs? A solar pool heating system pays for itself within about two to four years, compared to the other pool heating technologies. Solar panels also have very minimal requirements for maintenance. Solar Pool Heating is the cleanest, the safest, and the quietest way to heat your pool. Las Vegas Solar Pool Heating provides you and your family with a cost effective and environmentally conscious way to keep your pool warm and inviting even during the winter months. 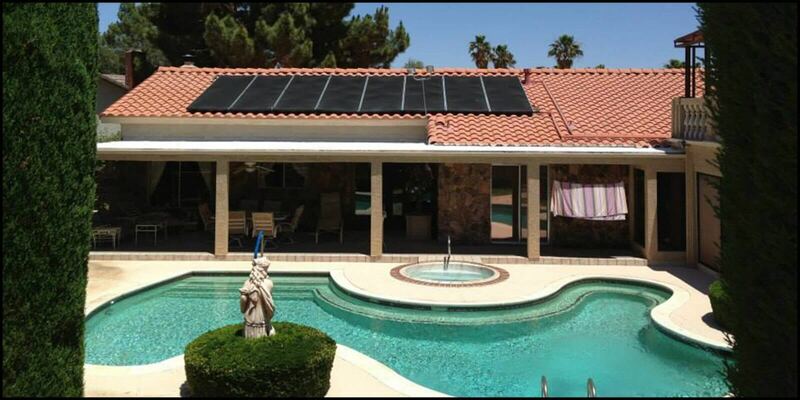 Las Vegas Solar Pool Heating systems can be installed with any pool, both new and old. They can be attached to the roof, hung on a rack, hung vertically on a fence and even laid flat on the ground. When you turn your filter pump on either manually or using an electronic controller, a diverter valve will divert some of the water as it leaves the filter. The water is then is sent to the solar panels which then heat the water with the power of the sun. As the water exits the solar panels, a tee fitting reconnects it into the pool return line, after the diverter valve. The heated water is then finally sent back down into the pool. A one-way check valve is used in between the valve and the tee, this is to prevent back flow or cycling of the water. Solar pool panels can raise your water temperature by 15-30 degrees if placed in the correct area. It is best to locate the panels where they get the most sun (at least 6 hours per day), but also not too far away from the pool equipment pad, so that connecting the plumbing and sensors is easier. You want to make sure you can place your panels so they get mostly southern sun (which is the direction with the most amount of sun in the Northern Hemisphere) and place them as close to your filter/pump as possible. Having at least 6 hours of unobstructed sunshine is recommended to get the most of they solar heating panels. Remember that the sun is always changing its position in the sky as the seasons change. For example, a tree in June that does not block the sun can flip and completely block out the sun October. You also need enough solar panel surface area to make a reasonable difference. A system that is too small will not sufficiently heat your pool enough, so solar pool heating usually requires a large solar collector area: usually up to about 80 percent of the swimming pool surface area.